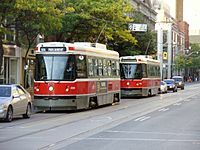 Streetcars in Toronto--a city that operates the largest streetcar system in North America. 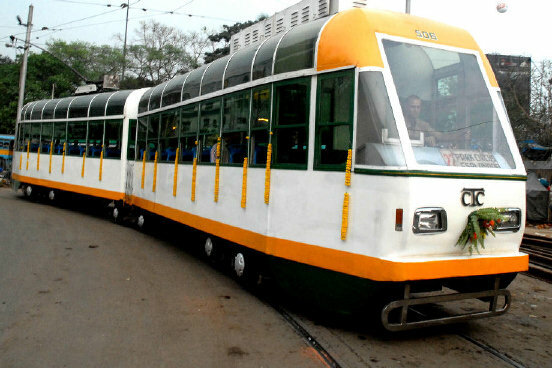 A tram (tramcar, trolley, streetcar, or street railway) is a passenger vehicle that is like a light train. It carries people to places within a city. Because a single tram can carry many people at the same time, riding on a tram instead of driving a car is a good way to help prevent pollution and stop the roads getting too busy. The word tram is used mainly outside North America, while within North America these vehicles are called streetcars or trolleys as they run mainly on streets. More modern and larger trams manufactured since the 1970s, such as the one in the second picture from Warsaw, are called light rail vehicles. These vehicles are bigger because they are very often made of two or more parts, with a bendy section in the middle which works like a human joint. In railway jargon, these types of vehicles are called "articulated". These may sometimes have their own right-of-way instead of traveling on the street and their stops are usually farther apart than the stops of trams so that they can travel faster. On Market Street in San Francisco, vintage streetcars from the 1910s through the 1940s, called "historic streetcars" (the F Market line), that travel on the street are a popular tourist attraction. Another city whose trams are highly used by tourists is Hong Kong, because here the trams have two floors which is very rare in the world. The largest tram networks in the world are in: Melbourne, St. Petersburg, Amsterdam, Berlin, Moscow and Vienna. 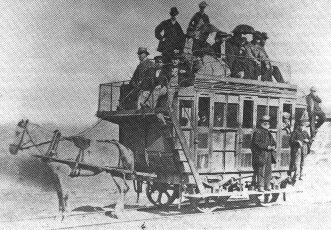 Trams first came into use in the 1890s, when they replaced horsecars--streetcars drawn by horses. In the 1910s to 1930s, in many metropolitan areas in North America, there were special bigger and longer streetcars that traveled long distances to distant suburbs on what were called interurban lines. These streetcar lines sometimes had "dedicated tracks" with their own right-of-way and made fewer local stops. In the late 1940s and early 1950s, in the United States, there was a conspiracy by Standard Oil, General Motors, and Firestone Rubber. They formed a company called National City Lines to buy streetcar systems, tear up the tracks, and replace them with buses in almost all the cities in North America. They did this so they could make bigger profits by selling more oil, buses, and rubber tires. Because of this, it was necessary to spend hundreds of millions of dollars of public funds in the 1980s and 1990s to reconstruct the streetcar systems as light rail systems using light rail vehicles. 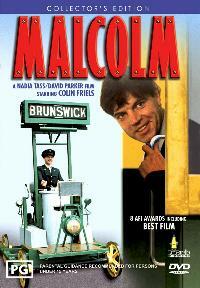 This conspiracy is obliquely referred to in the 1988 film Who Framed Roger Rabbit?. Former second generation cable tractor, used between 1978 and 2005, assisting a tramcar on the cable section of the Opicina Tramway in Trieste, Italy. CarGoTram run by Volkswagen in Dresden, Germany on a section of grassed track. It delivers parts to the Transparent Factory. 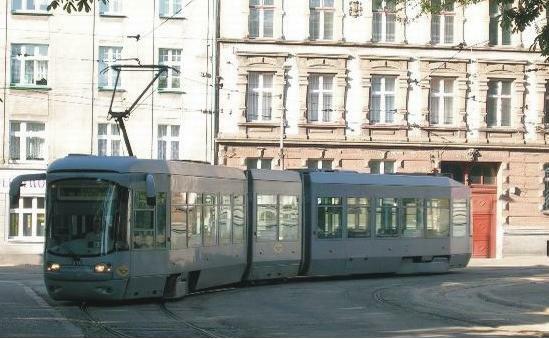 Czech Tatra T3 – 14,113 units sold worldwide make it one of the highest-selling types of tram. A lithographic transfer porcelain plate commemorating the launch of the first trams in Moscow and Nizhni Novgorod, in 1896-99. Decorated with a tram running on an overhead electric cable, the plate also shows a building with an onion-shaped dome. Designed by Vitaly Vlasoff. Imperial Porcelain Factory, St Petersburg, 2006. Tram Facts for Kids. Kiddle Encyclopedia.